Welcome to my A2 music video blog, our track is Nine Inch Nails - Metal. Enjoy! 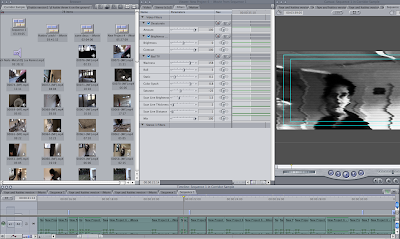 How did you use new media technologies in the construction, research, planning and evaluation stages? Q2: How effective is the combination of your main product and ancillary texts? 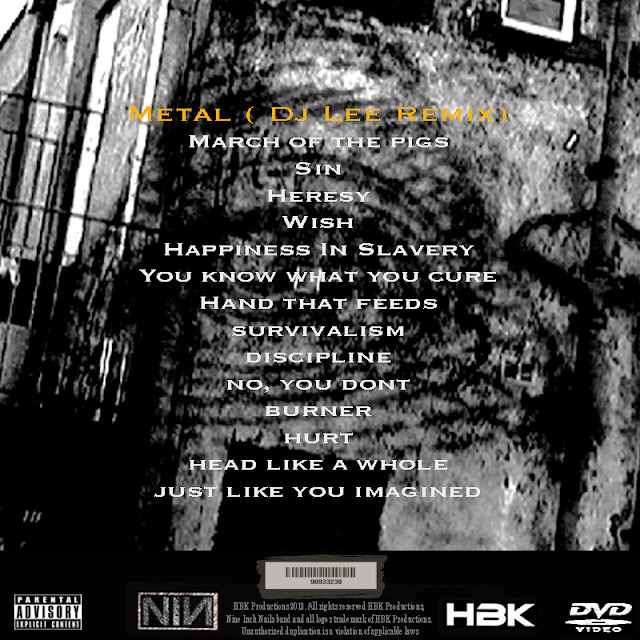 I created my digipak in the software Adobe photoshop, this was a goodsoftware to use as I could use different image and text effects. 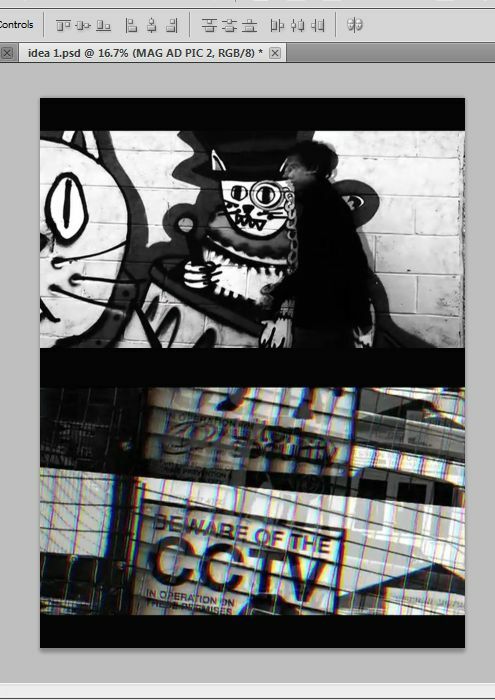 Firstly I used a shot that we had used in the music video, the shot of the the warehouse, i printscreened this fromthe video footage as a JPEG and imported it into photoshop after this I adjusted the levels of the colour to add a darker black and white effect to thephoto. 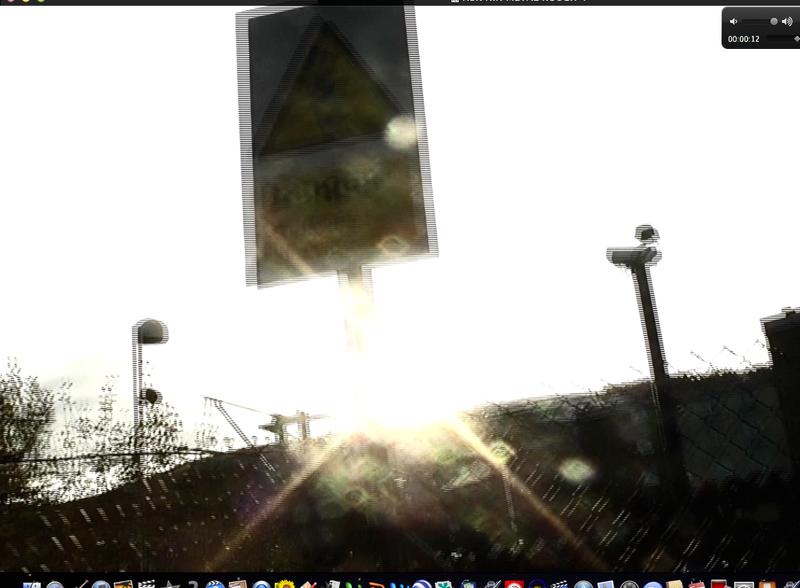 I again took a printscreen from our video, this was a printscreen of anilluminati eye, i used multiple layering and a blending modes and changed theopacity to blend the eye to look like it was on the wall. 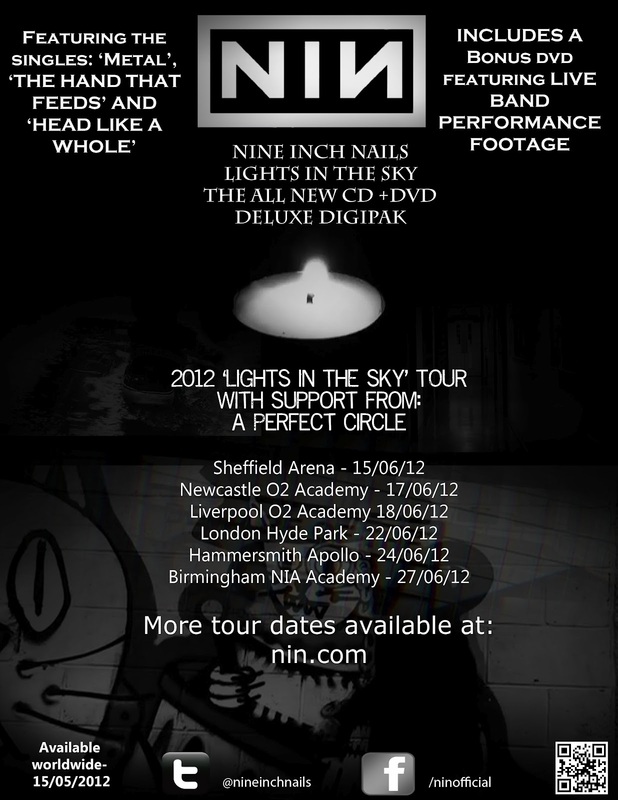 I used a small gold font for the artistname, but most our of audience would recognise the NIN logo. 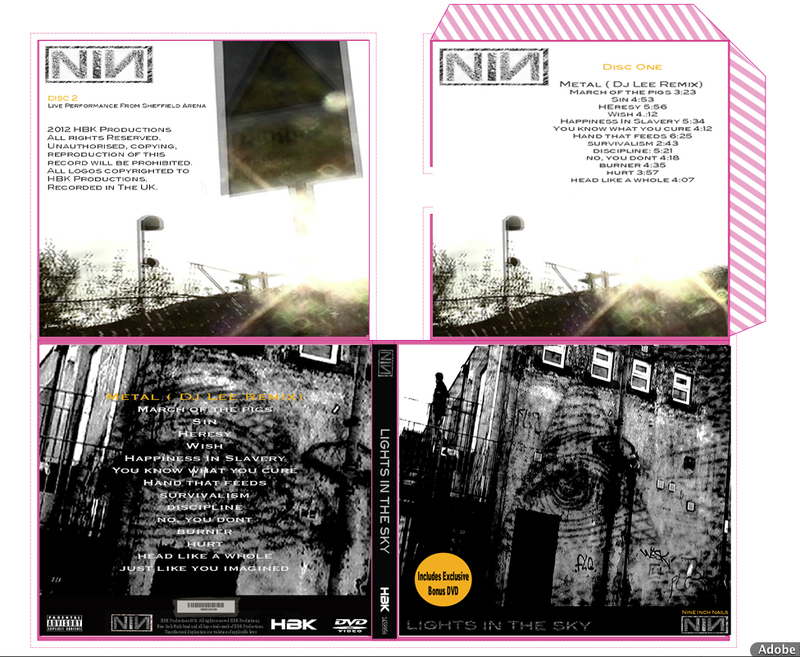 For the rear of the digipak I used the same image as the front but zoomedin as this is common to have correlation between the front and rear panels. I added a black rectangle at the bottom of the page to include company logo's,copyright information, barcode, social media # and @ which I imported the facebook and twitter icons. 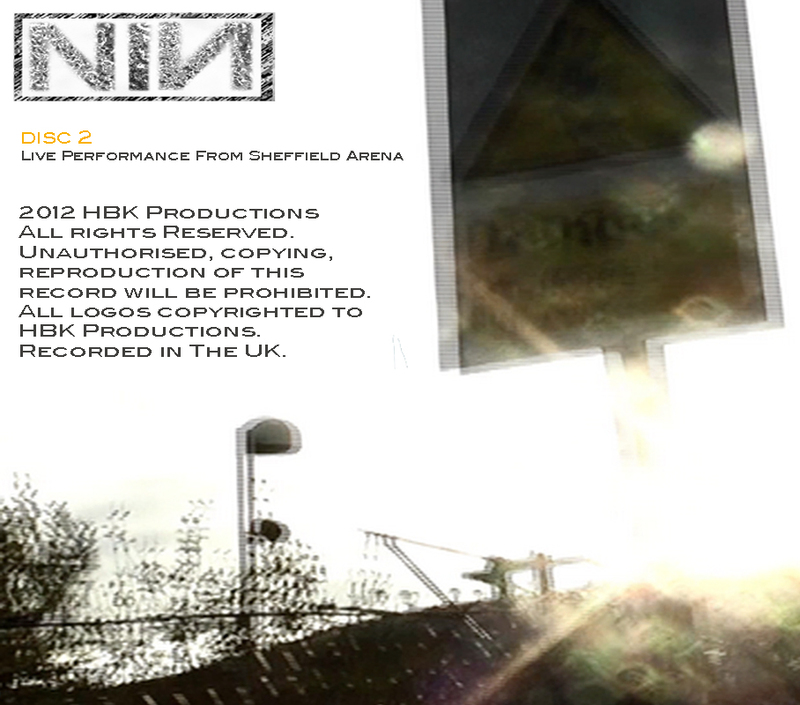 I used a white font to stand out for the background to include the set list ofthe album. 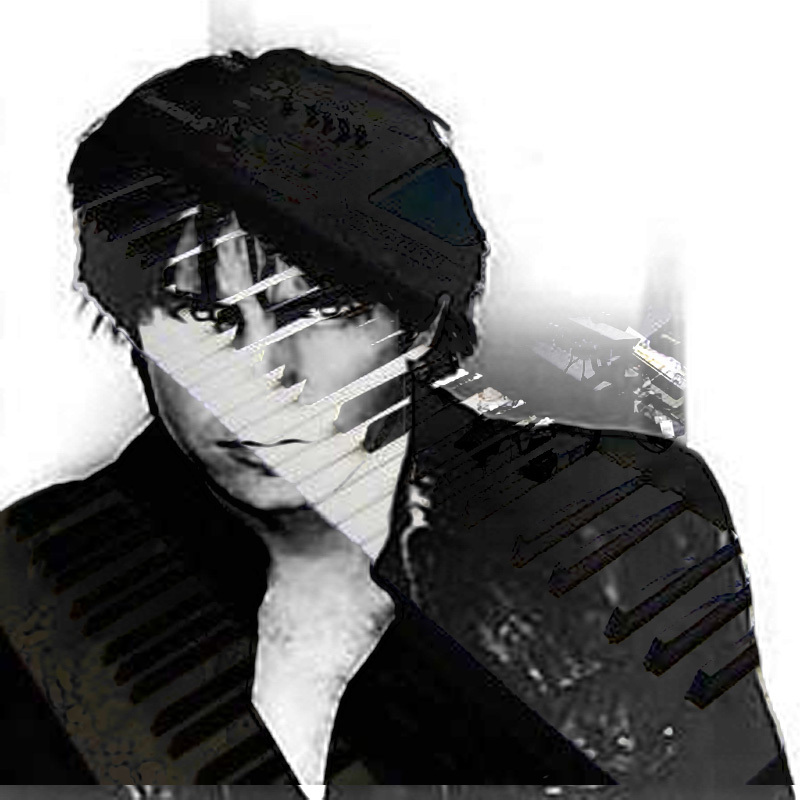 I edited the inner panels again by using blend modes and adjust the lightinglevels of the image and zooming and cropping in to create a nice effect where the two images were linked but still different. 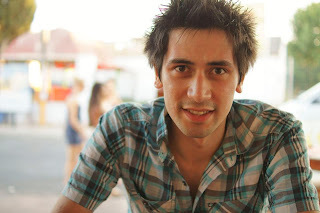 Audience feedback is of paramount importance and absolutlet vital when creating a product, gaining feedback is the best way to refine your product so that its fit to the audience. It gives an honest opinion of what works and what doesn't and this is incredibly helpful to get different perspectives on your products because sometimes when youre making the product you don't notice its flaws and what you need is for someone to just say No that isn't working. We have taken feedback from a wide range of people over the past few months which has led to doing more and more drafts until eventually we got our polished final pieces. 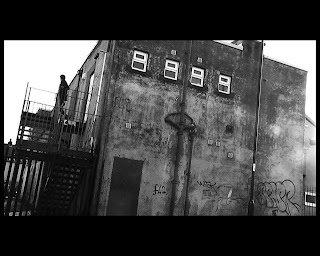 For example the video is so different to how we ever imagined and this is through changing it to fit the audiences comments like when they didn't understand what was going on in the video, we made the narrative easier to follow. There were many different ways we gathered feedback, one being showcasing our work to a class full of media students who were also making a music video so knew the codes and conventions and were able to offer us a very critical response to our products. This was perhaps the best way to get feedback because we managed to get alot of valid feedback in a short space of time as the footage was showed to the whole class. We got feedback from our teacher who offered a very critical and proffesional approach and had the media knowledge to determine what was working and what wasn't. It was also good to get feedback from people who didn't know much about media and offered a basic review of the products and what they didn't like or did like. 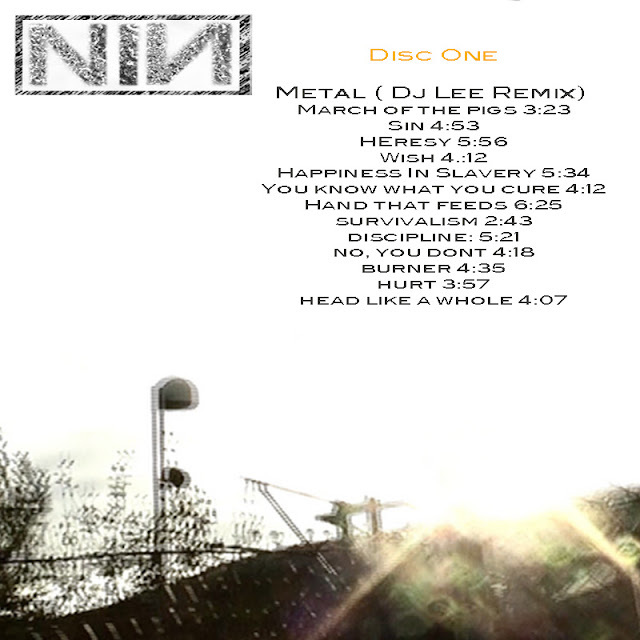 We used social sites like Facebook and Twitter to gather feedback online from Nine Inch Nails fans and also we posted our work on a Nine Inch Nails fan site forum. This was great because we got good feedback from people who were in our target audience. In what way does your media product use, develop or challenge form and conventions of real media products? 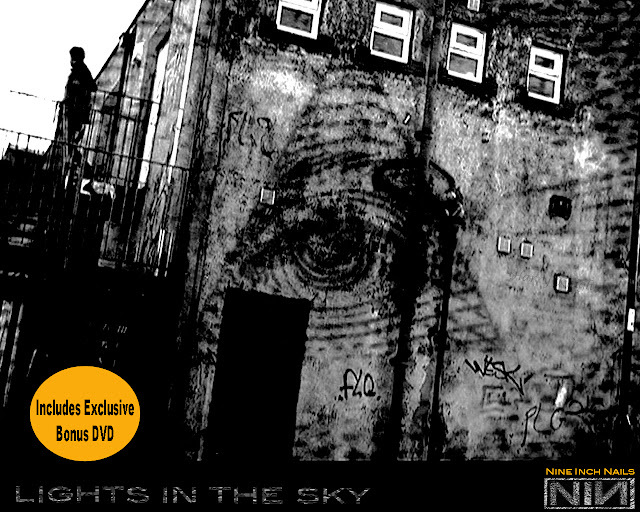 Like for both the video and Magazine advert the Digipak also required alot of different drafts until it was finished. Feedback gained on the digipak suggested that the design was good but it was some of the small details that let it down, things like not being able to read the track list on the back. Replace QR code with bar code. Nine Inch Nails have never explicitly stated that they are members of the industrial genre. For example Pretty Hate Machine (1989) was much more of a synth pop album with elements of Industrial mixed in- although he admits to 'Down in it" being heavily inspired by Skinny Puppy- Dig It. Skinny Puppy being a Canadian Industrial group noted for their abstract and shocking music. Pretty Hate Machine being closer to Cabaret Voltaire's style of Industrial, much more computer generated beats and loops, using samples but not straying too much into Rock. The Industrial influences of Ministry come across far more in the next release 'Broken', which was an overall much heavier album which clearly draws on from ministry's heavier vision of the industrial genre, with songs such as 'Happiness In Slavery' and 'Wish'. 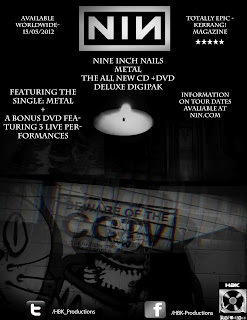 The next Release, 1994's, The Downward Spiral draws into the industrial genre heavily, the computer generated music fused with the instruments it's far more of a 'typical' Industrial record dealing with the traditional Industrial themes of the break down of society and what that'd cause0 a theme strong throughout every song on the album. This is where many say that Nine Inch Nails really came into the genre and it inspired much of the Industrial music available now. The Fragile was in many ways much more of an album that's in many ways quieter than prior releases, also much longer and in almost a contrast with the Downward spiral, its a much more personal based album. With_teeth is a much more mainstream Rock album, its very punchy in line with a more modern approach to industrial music and the industrial design. It's interesting to note that around this time Skinny Puppy launched back into action. Year Zero is where the real politics of NiN comes out, highly critical of the Bush administration of America (as many musicians where). 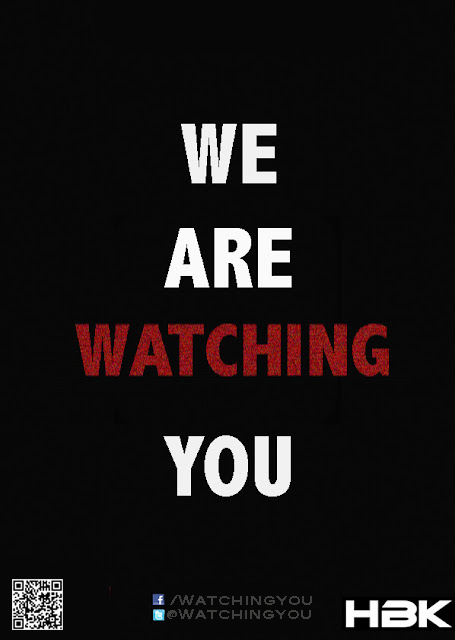 It details a near future society where the American government was too powerful and merged with the church- it accompanied a ARG (alternate reality game). 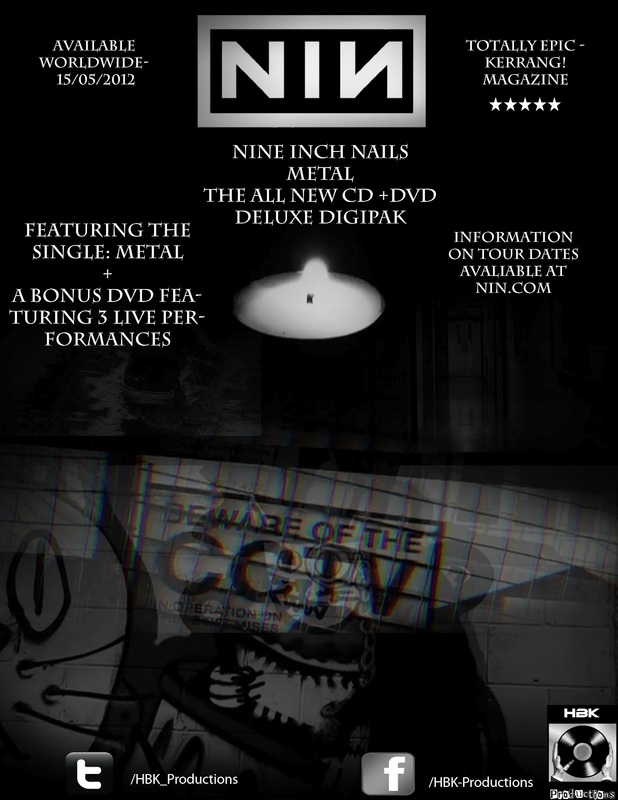 Include "Best of Nine Inch Nails"
So now we've got a second rough cut done, with some of our new footage including our new character and locations we wanted to gain some feedback on this so we showed it to everyone in class and also posted the clip on an official Nine Inch Nails forum. 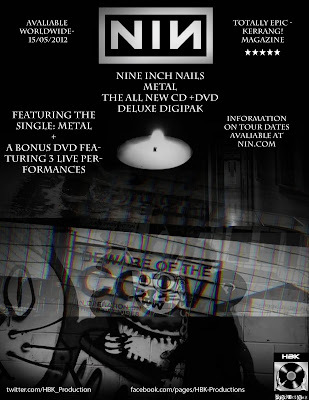 We were lucky enough to get feedback from a forum administrator who fit into our secondary audience a 25 - 34 year old existing Nine Inch Nails fan. This was great to get feedback by someone who really new the genre and especially Nine Inch Nails. I used the image of the Graffiti cat and the image of the CCTV sign as the base for the background after first changing the background colour to black. After inserting the first 2 images into Photo shop I added a 'layer mask' to the image of the cat and then used the gradient tool to blend the 2 images together (after overlapping the images where I wanted them on the advert). I also used the gradient tool to blacken the edges of the advert, so that the writing that I was planning to put at the bottom (URLs) would stand out sufficiently. After I had the first 2 images looking how I wanted I then added the next two (the puddle and the corridor) in parallel above them and again used the layer mask and gradient tool to blend them on top of the other images. 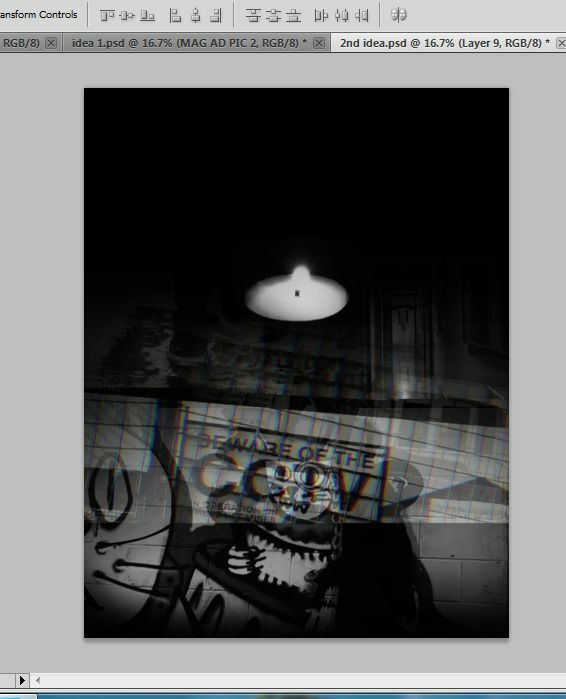 I then did the same with the candle image, placing it in between but slightly above the top two images of the puddle and the corridor. I have started work on creating the inner panels for the Digipak. After this i found an image of trent reznor the lead man of NIN and used Pin Light blending mode to create a nice layered effect. 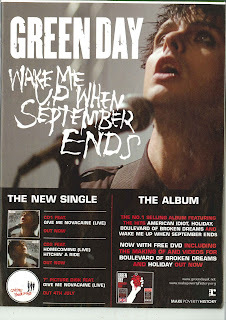 This magazine advert is split in two, with the main focus of the top half being an image from the performance section of the video for "Wake Me Up When September Ends", and the band/ song name. The bottom half of the ad features all the information about what is included with the album/single. It's structured in this way so that the viewers attention is caught by the large image and this encourages them to read the details in the bottom half of the advert. This is the digipak of the a cuban jazz assortment band. The cover image is very eye catching anf stands out against the textured cream background. The colours and the brightness of the cover image really reflect the type of music and culture this digipak would be linked to. 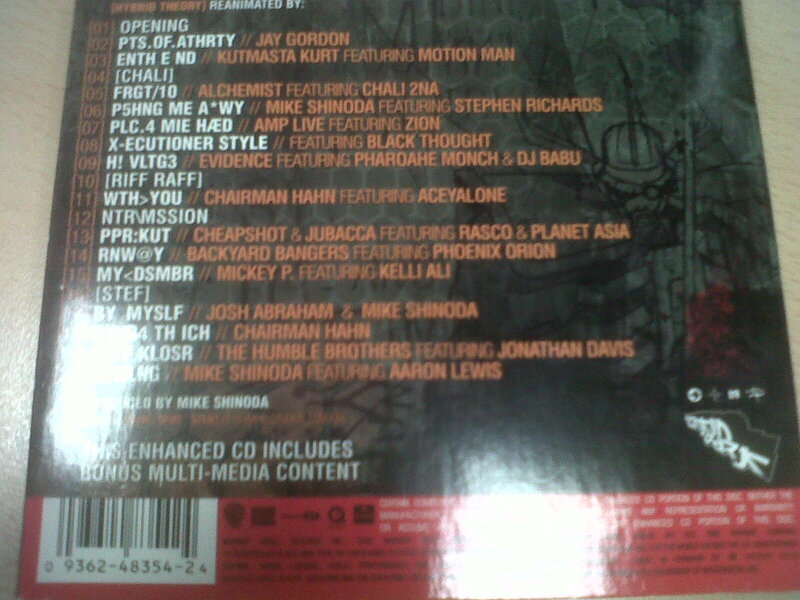 The digipak doesnt have any stickers on the front but does have a list of what artists it does feature which does the same thing, advertising whats inside. The inner has a background of a cuban building then on top of this is another layer, this layered effect could be created on the software Adobe Photoshop which we have at school. At the bottom of the inner panel is a quote about climate change in a purple font. The back has the albumn name written across the top largely. The graphic thats seen on the front is again showed on the back. Below this is 3 logo's, one of the record label and two of the charity of which money is being donated too. There is information on how some of the money raised from the CD will go to charity in a small black font. Below this at the very bottom of the Digipak is copyright information on the CD. 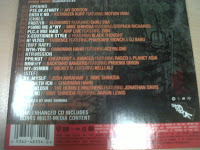 In the bottom right of the back cover is a scannable bar code. 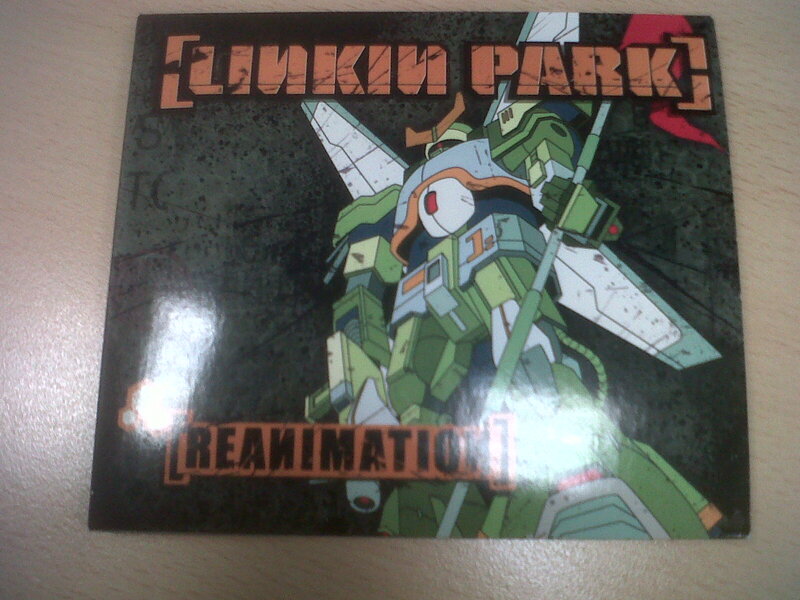 This is the Digipak for the album Reanimation by Linkin Park. 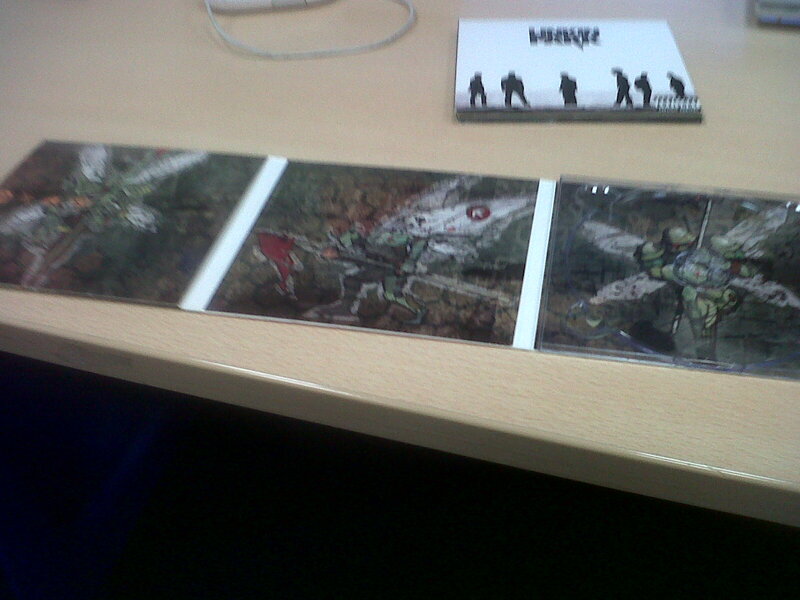 For this digipak they have gone for a cartoon/ animated graphic for there front cover. The cover has an animated drawing of a robot or transformer type character. 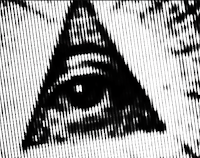 The band logo is written in a large orange font in brackets along the top of the cover. 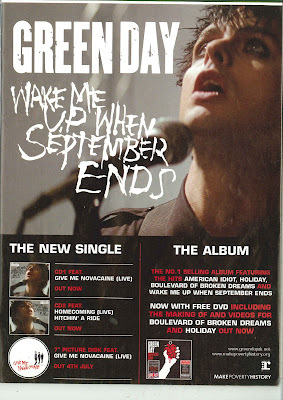 There is also the album name written in the bottom left corner in a bold black and orange font. In the inner panels there are more graphics of the transformer character in various different poses. All photos have similar background just that the actual transformer changes. The text on the back of the digipak is quite confusing, it is set out like the standard list of tracks but the text is quite obscure in orange and white fonts. 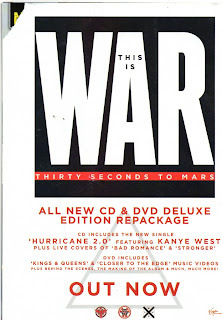 There is a red banner along the bottom of the digipak, this has a scannable bar code, copyright information and logos of the production company. After looking at a range of different digipaks it was clear that there were codes and conventions that were similar throughout each digipak. Album and Artist Name - Every digipak I looked at had the name of the album and who it was by on the front cover of the album. 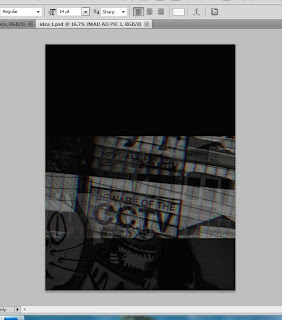 There is always either a picture or a textured background as the front cover. 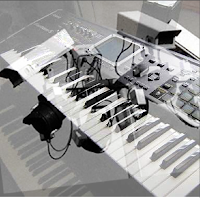 The inner panels often include a photograph of some sort and the images of the panels are usually similar, if not the same image but just edited differently. The image on the back is usually linked to the image on the front. 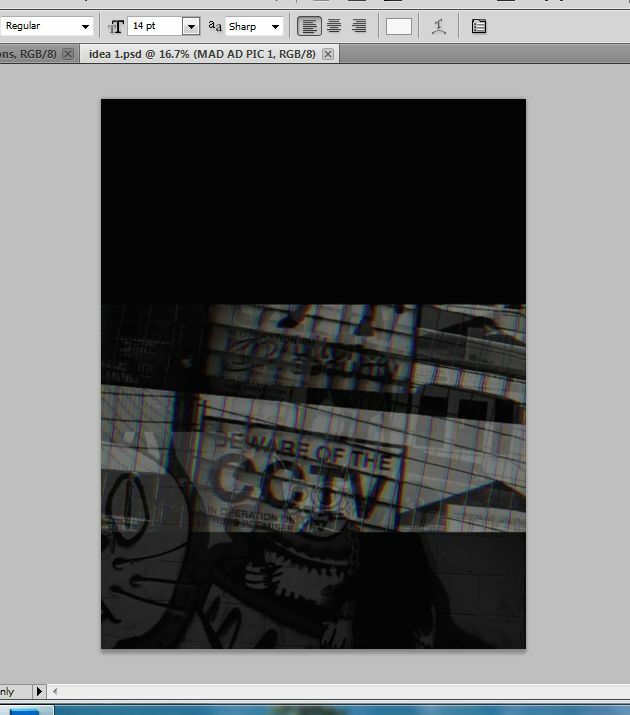 There is always a bar code on the digipak.